CPIC were proud sponsors of the Diamer-Bhasha Dam Charity Dinner hosted by the Ansar Welfare Association at the Epsom Downs Racecourse on Saturday 26th January 2019. The Diamer-Bhasha Dam is being constructed to battle the water shortage situation in Pakistan. Building new dams and adopting water conservation strategies are critical for the future of Pakistan which is why the former Chief Justice Mian Saqib Nisar initiated a worldwide crowdfunding drive in July last year. CPIC recognises the importance of such activities that will bolster Pakistan’s growth and prosperity, which is why we were delighted and humbled to be the main sponsor of such a significant event. To commemorate this momentous occasion we contributed £500 to the fund for every plot purchased on the day. We had the opportunity to set up a pop-up stall at the event as pictured above. 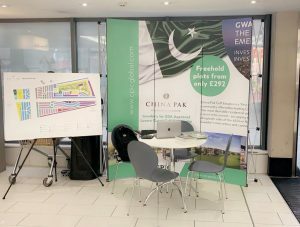 Attendees flocked to the stall to find out more about our investment opportunities in Gwadar and how the development of the port city is changing the face of Pakistan as part of the broader $62 billion China-Pakistan Economic Corridor (CPEC) initiative. CPIC aims to bring positive change to Pakistan through the construction of safe and sustainable communities that encourage cohesion, enabling businesses to thrive offering a positive lifestyle for all those involved. As one of the few international companies truly committed to the betterment of Pakistan we will continue supporting such events in the future. If you would like us to be a part of your event please contact us via +44 333 733 3337 (UK), +1 212 365 2742 (US), info@cpicglobal.com or https://www.cpicglobal.com.